Wait for me... Who knew the power three little words could have in starting an international travel adventure? This inspiring book is for all the dreamers, would-be adventurers and endearingly practical professionals looking to scratch the travel itch. 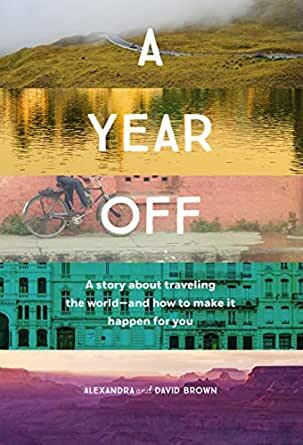 With many gorgeous photographs and actionable travel advice, A Year Off captures all the beauty and magic of the wanderlust spirit, guiding readers on how to take the same leap and showing them just how doable a journey this type of round-the-world travel is. 5.0 out of 5 starsSurprised! This book is a great story tucked into a comprehensive guide to making a dream real. I meet so many people who have "taking a year off and seeing the world" as their dream or it's on their bucket list. I love the fact that this guide can talk through every step to making it real - down to the dollar! My dream would be that every one of those people finds this book. Five shining stars for this magnificent memoir of love, travel, adventure, wit, wisdom and faith in the goodness of humanity. Whether your dream is to journey around the world, or to find joy and inspiration around the corner, A YEAR OFF will take you there. Huge thumbs up! The book was ok . It a few good travel points. But I wanted more about this couples travel experience than how their relationship grew over the travel year. 5.0 out of 5 starsDetail-oriented and fun! Must-read for anyone who dreams of this. Great book with fun and practical advice. Even if this doesn’t ever come true for me, I love the dreaming!